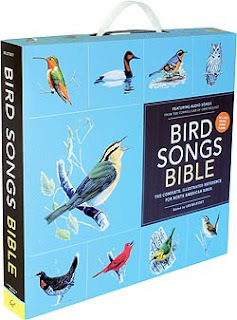 Ithaca, NY—There’s that old saw about a “bird in the hand.” Better use both hands for the Bird Songs Bible: The Complete Illustrated Reference for North American Birds, edited by Les Beletsky. 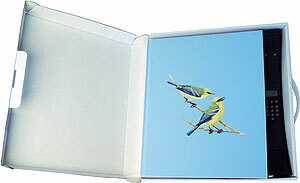 This deluxe offering from Chronicle Books blends artwork, information, and sounds for all breeding bird species found in North America. The songs and calls for each species come from the Cornell Lab of Ornithology’s Macaulay Library. Each species account includes four-color illustrations and range maps, showing where the bird is likely to be found. Information about the bird’s habitat, behavior, and vocalizations is also included. But the most unique feature of the Bird Songs Bible is its sound player. The numbered recordings match up with the appropriate species. From the nasal honking of the Trumpeter Swan to the clucks, rattles, and whistles of the Yellow-breasted Chat—this is a great way to practice learning how to identify birds by sound before testing your ears in the great outdoors. Editor Les Beletsky is a bird biologist and author of Bird Songs and Bird Songs from Around the World, also from Chronicle Books. He lives in Seattle, Washington. The Bird Songs Bible retails for $125.00.